Thyroid Zone's balanced formula will ensure that you consume the right amount of each nutrient, not too much or too little. It takes out the guesswork and delivers what your thyroid needs to stay healthy. Each serving packs a punch of important minerals, vitamins, and herbs that are crucial to healthy thyroid function. These include: Iodine. Your body simply needs iodine to make enough thyroid hormone. 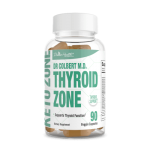 Thyroid Zone provides 150 mcg, 100% of your iodine needs. Iodine deficiency can lead to hypothyroidism, weight gain, fat gain, fatigue, sluggish metabolism and more. Selenium. 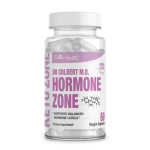 By weight, the thyroid contains more selenium than any other organ, and Thyroid Zone supplies a whopping 200 mg selenium (286% of daily needs). Selenium is required to properly convert T4 into T3, activating thyroid hormone. Selenium also protects the thyroid gland from oxidative stress and damage. It decreases symptoms and risk of Hashimoto's Disease. Selenium maintains the balance of iodine in the thyroid; without it, unrestricted iodine levels would lead to destruction of the thyroid gland cells. Zinc. Zinc supports both T3 and T4 levels and the conversion of T4 to T3. This important pathway is required for activating thyroid hormone. Copper. Copper deficiency can affect the hypothalamus, leaving it unable to regulate thyroid hormone effectively. Copper deficiency is associated with low T3 levels. It also plays a role in the metabolism of tyrosine, which is a precursor of T4. Vitamins A, D3, and B12: These Vitamins decrease your risk of thyroid disease and neurological damage. Whatâ€™s more, they support energy production and vitality. Most people with low thyroid function are also deficient in these important vitamins. Ashwagandha extract. This amazing herb supports thyroid function by decreasing thyroid stimulating hormone and increasing T3 levels. Guggul extract. Guggel is a natural gum resin that supports thyroid health. It has been shown to significantly increased iodine uptake, T3 resin uptake, protein bound iodine, and free T4 levels in thyroid tissue. It also reduces hepatic oxidative stress and supports balanced hormone health. Coleus Forskohlii. Coleus Forskohlii improves low thyroid function by activating enzymes in the thyroid, increasing levels of T3 and balancing T4. L-Tyrosine, Schizandra, Kelp, Bladderwrack, and Cayenne all further support thyroid function by supplying needed precursors to T4, supplying natural iodine, improving metabolism, and supporting important thyroid enzymes and cells.